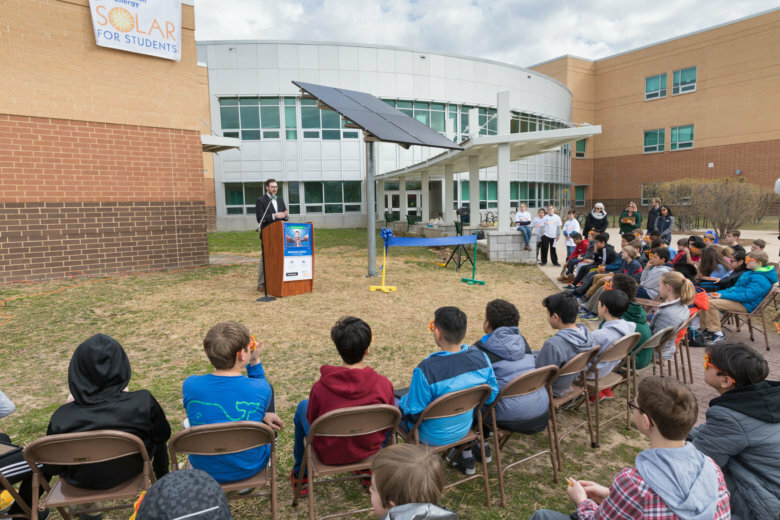 Dominion Energy's "Solar for Students" program has expanded to more schools, including Kenmore Middle School in Arlington, Virginia. WASHINGTON — It’s like a giant science experiment that teaches students how solar energy works. Dominion Energy’s “Solar for Students” program was introduced three years ago at four Virginia schools, including T. Clay Wood Elementary School in Prince William County. With the success of the program, it has now expanded to more schools, including Kenmore Middle School in Arlington. The hands-on educational program provides each school with a large solar panel, as well as classroom materials and training for teachers. “We thought it was a great opportunity to teach young people about solar and so we created the ‘Solar for Students’ program,” said Chuck Penn with Dominion. The students can watch the displays in their classrooms that show real-time data on the electricity that’s being generated from their school’s solar panel. He said that Kenmore Middle School held a ribbon-cutting for the school’s new solar panel in March. And last week, Penn said other educational places received their solar panels, including Charlottesville-Albemarle Technical Education Center in Charlottesville; Deer Park Elementary School in Newport News; Hampton High School in Hampton; the MathScience Innovation Center; and the Children’s Museum of Richmond. During the 2018-2019 school year, eight schools in southwest Virginia will be included in the program. The four schools that were part of the pilot program in 2015, besides T. Clay Wood Elementary School in Prince William County, include Shenandoah Valley Governor’s School in Fishersville; Goochland High School in Goochland; and Landstown High School in Virginia Beach.